1)You can get it ready now, before the mad Christmas rush kicks in, it stays lovely and crunchy in an air-tight container. 2) You can tailor it to your families dietary needs – it’s totally allergen free unless you choose to add tree-nuts or sesame seeds if they are safe for your family. 3) You can tailor it to your families preferences, for example we hate dried fruit in granola – why oh why do they add that to the mix? So we miss it out of ours. You can add as much dried fruit to yours as you fancy – the recipe tells you when to do it. You choose which Christmas spices, seeds, flaked grains, gluten-free flours you want to use… the variations are endless. 4) It smells delicious as you bake it and fills your home with yummy aroma. 5) There’s something very gratifying about pouring your cooled crunchy granola into your kilnar jar – I made a little video of it you can see here! 6) It’s really easy to make but people are impressed you made it yourself – if you get a kick out of that kinda thing! I hope that you are feeling inspired to give home-made vegan gluten-free granola with Xmas spice a go! I am not sure that our latest batch is gonna last until Christmas Day it’s so yummy. We love it with a dollop of coconut yogurt, or with home stewed apples we also serve it with our spiced drop scones for a bit of texture if people fancy some crunch! This was scheduled to be posted on Wednesday but somehow “missed schedule” so you are getting it today instead – post our rubbish hospital appointment… this cheery post was written earlier in the week! I will be back with more Xmas recipes – focussing on them and feeding up my son will bring us some much needed seasonal good cheer after our shocker of a day at hospital yesterday. 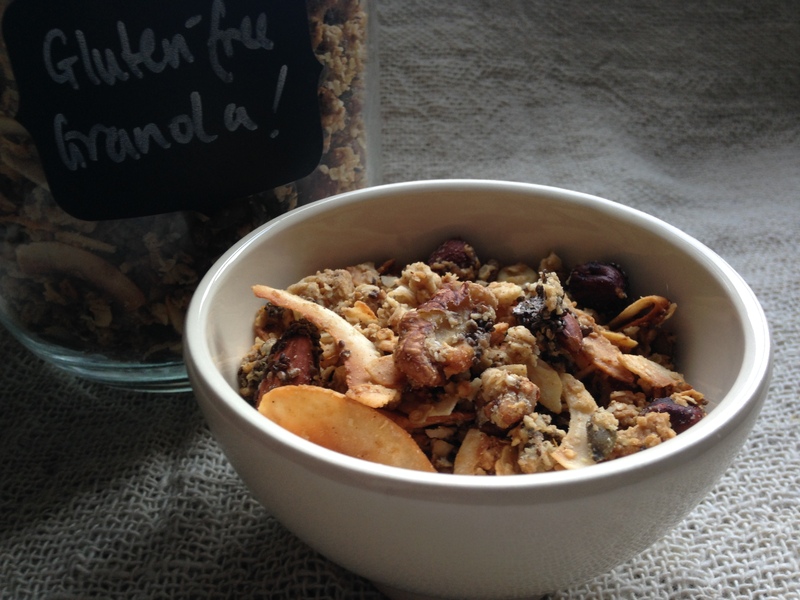 Gorgeous gluten-free granola; exceedingly scrummy with seasonal spice. You can make this recipe unique for your families dietary needs, just make sure you keep the proportions the same, if tree-nuts are safe for your home add them! If you like Christmassy dried fruit add them at the very end before your pour the lot into your awaiting jar. Preheat the oven to 130° C (fan oven) and prep a couple of baking trays with baking paper. In a mixing bowl combine the dry ingredients, use whichever gluten-free flours and flaked grains your family prefers. Stir in the desiccated and flaked coconut and any chopped tree-nuts that are a safe ingredient for your home. If you have soaked the larger whole seeds (pumpkin & sunflower seeds) and whole tree nuts overnight, drain and rinse them then add the chia and flaxseeds to the bowl of drained nuts and seeds to absorb some of the moisture. Add the seeds (and nuts) to the mixing bowl of dry ingredients and stir in, then pour the lot into the big pan of wet ingredients. Stir until everything is coated in the wet ingredients. Split the mix between the two baking trays and spread it out so to fill the trays. After 20 minutes move the mix around, so it all gets baked and goes crunchy and swap the position of the trays in the oven when you pop them back in. Leave to bake for a further 10 minutes. Then remove from the oven. Leave to cool completely before transferring into your 2 litre kilner jar. If the granola is still warm it will create condensation in the jar and your granola will loose its lovely crunch and go a bit soggy. If you like dried fruit in your granola you can add as much of it as you fancy at this final stage. We don't!! *I love a citrus zing at Christmas but if you are less keen reduce the amount of fresh lemon juice you use or swap it for some orange or clementine juice. ** I use a mix of desiccated coconut, roasted chopped hazelnuts and flaked almonds. *** I use ½ C pumpkin seeds, ½ C whole almonds, ½ C whole hazelnuts soaked rinsed and drained. Then ¼ C dry chia seeds and ¼ C dry flaxseeds.